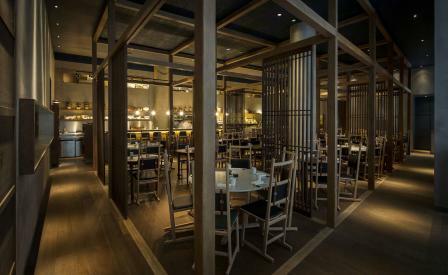 Having established a stream of successful restaurants abroad — most recently The Kensington Street Social at Sydney’s Old Clare Hotel — Jason Atherton has returned to London to open his seventh restaurant in the capital, the izakaya-styled Sosharu. Helmed by Executive Chef Alex Craciun, who temporarily relocated to Kyoto in preparation for the launch, the restaurant offers casual yet refined Japanese cuisine made with seasonal British ingredients. Diners can expect small dishes taken from different specialities from the country such as sashimi, temaki and hibachi grill, alongside a litany of innovative plates, like chashu pork belly, udon and king oyster, finished off with imaginative desserts like apple pie with miso butterscotch. Housed in Clerkenwell’s Turnmill Building, the design is provided by Shanghai-based studio Neri & Hu, and plays on the concept of Japanese domesticity, with three distinct areas — a dining room, chef’s table and a lower level bar named Seven Tales — wholly defined by function and linked by a layout mirroring that of a Japanese house. Specifically looking towards the country’s traditional minka homes for inspiration, Neri & Hu have adopted their abstracted timber structures in the main dining room, as well as adding sliding doors, long stone counters and high Japanese denim curtains elsewhere. Downstairs in the basement bar, Sosharu takes on a more urban guise and reflects Japan’s subcultures by way of customised wallpaper depicting golden age movements, and references to art and architecture. The cultural allusions do not stop there, with bar manager Geoff Robinson’s drinks menu making frequent nods to Japanese concepts and philosophies for a selection of potent tinctures that offer depth every sense.